Hakodate Shain no Shusse Beer is a 4.5% English style bitter from Hakodate Beer, based in Hakodate, Hokkaido and it is part of their all-year round line up of beer. The name roughly translates to “The Beer for The Promotion of Employees”, suggesting that whenever you get promoted, you should drink this beer. The way the economy is going at the moment, Hakodate Beer are either hoping for a sudden flourish in the promotion stakes or they know something that we don’t. While the shacho, or office boss, gets barleywine, the employees only get a bitter ale. At the time of writing, we’ve only come across Hakodate Shain no Shusse Suru Beer in bottles only. Would the shacho drink this beer all night long as well? Hakodate Shain no Shusse Suru Beer, besides having a really long name, also comes in a highly decorative bottle of people celebrating their promotion it seems. I guess they’re in for a long night of drinking, hence why this beer is only 4.5%, so it’s a surprise Hakodate Beer didn’t add session somewhere in the name. It poured out a dark golden colour, with hints of amber in the body. The aroma was slightly sweet, of caramel and some dried fruit, along with a hint of citrus fruit from the bitterness. Having not drunk an English bitter in a long time meant me hunting down some John Smith’s but instead ended up with Boddington’s – and let me tell you – that was a major disappointment. Hakodate Shain no Shusse Suru Beer tasted pretty similar to it in all honesty. It had a creamy caramel taste to it with a smucker of bitterness on the tongue that was fleeting. Before I had the time to register the flavours, it had dissipated away to nothing. It was an easy drinking beer though the aftertaste was so brief that all I could remember of it was some light bitterness. 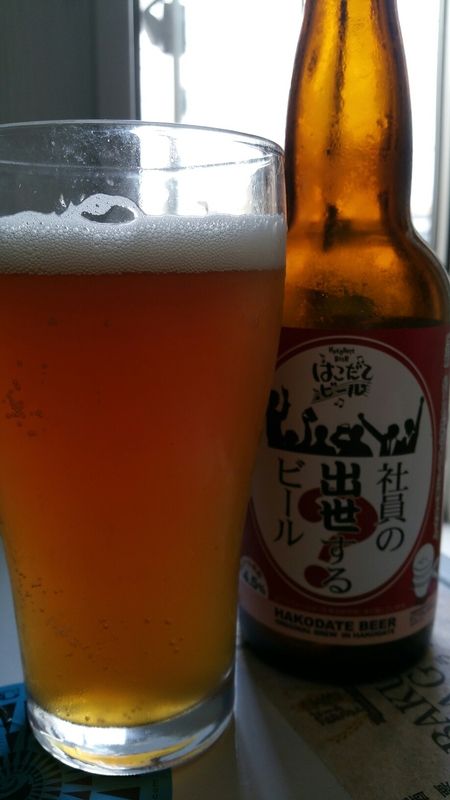 I guess Hakodate Shain no Shusse Suru Beer is an ok beer – it’s drinkable and refreshing but certainly not memorable.